At last a practical guide on intuitive decision-making for anyone in the business world to get to the answer they need faster. Intuition is the great differentiator in business. Listening to, trusting, and acting on your intuitive intelligence separates you from the pack as most people are not listening to theirs. Intuition is the one intangible skill that enables teams to function at a higher level and add more dimension and power to their ability to solve problems and grow. Yet the question that each business leader and manager struggles to answer is how do you train and develop intuitive thinking in a team to achieve the greatest result? 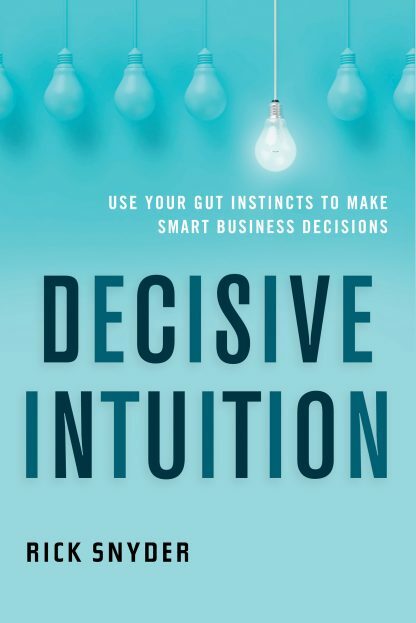 Decisive Intuition is for business leaders, managers, and employees who want answers to this question and are ready to accelerate their company culture. Practice this 6-step process for harnessing your intuitive intelligence with practical business applications. Hear how successful business leaders are integrating intuitive skills into their companies for cutting-edge results. Explore directional, social, and informational intuition and how you can apply them to different areas of your business for greater results. Learn about the 5 roadblocks to accessing your intuitive intelligence and how to overcome them. Discover the latest findings in neuroscience and techniques to access your intuitive, subconscious mind for arriving at better decisions, faster. Rick Snyder is the CEO of Invisible Edge�, an international consulting company that serves as trusted advisors, mentors, and strategic partners for forward-thinking executives and companies. Snyder combines his MA in psychology with his business experience to advance intuitive intelligence and skills into his clients� business plans and company culture. His breakthrough strategies have been implemented by executives and businesses in Europe, Africa, Asia, and the Americas, and he brings a global perspective to his teachings. Snyder currently resides in Monte Sereno, California. For more information visit decisive-intuition.com or invisible-edgellc.com.